Ever have one of those dreams where you have to pee and can’t find a bathroom? What if that dream lasted for years without relief? Ever meet someone where something just feels “off” about their appearance? What if that’s because they aren’t exactly human? 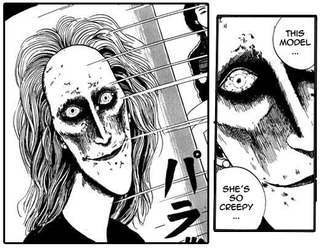 It’s that kind of everyday horror that makes Junji Ito great. Episode 2 of Junji Ito Collection marks a vast improvement over the lackluster premiere, adapting two well-regarded tales, “Fashion Model” and “Long Dream”. The backgrounds are lush and gorgeous, the animation design is faithful to the original art, the color palate is well-chosen, and the direction is great - a big improvement on the pacing this time. The animation isn’t the smoothest, but chilling, moody scares don’t require crazy sakuga levels of realism. And that’s exactly how to describe these two stories: chilling and moody. This time, the runtime is divided more or less equally between the two stories. “Fashion Model” adapts the story of a student filmmaker haunted by the eeire visage of a model in a magazine. Her Unncanny Valley looks stick with him until his classmates end up convincing him to cast her in their next film along with a more conventionally attractive actress. The short is almost an exact adaptation, and its woodland background art really shines through as does the unease that the ghastly model’s presence causes the other characters. In “Long Dream,” a man is admitted into a hospital with a strange condition. Each night, the passage of time that he perceives in his dreams gets longer and longer. As he wakes, he finds it harder to remember the previous day, and his body begins to match the changes his mind experiences. As mentioned in my last post, “Long Dream” has been adapted previously to live-action. Whereas the TV special added to the story to stretch it out to one hour, this adaptation cuts a few lines and panels here and there. I wish they hadn’t cut some of the nightmare imagery of the manga. However, the character design does a fine job reflecting Ito’s talent at depicting interesting and varied faces. Here’s the trailer for the live-action version. If you can it track down, I highly recommend it. It seems like the series is using a somewhat different numbering system from The Horror World of Junji Ito manga collection. Last week I predicted that the tales would be “Ryokan” and “Long Dream” - only the latter was correct. “Fashion Model” should have been No.043, so who knows what numbering is being used here? I don’t know of any other edition of collected works other than the English ComicsOne or Dark Horse. I have a feeling that there will be a new, remixed Japanese release to coincide with the anime. In any case, next week’s preview lists Collection No. 080 and 066. By my count that would be “The Back Alley” from Vol.12 The Bully and “The Smoking Club” from Vol.10 The House of Marionettes. Again, we’ll find out for sure in seven days.